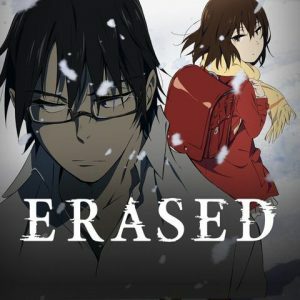 If Stephen King scripted an anime, it might look like Erased, which Anime Limited is releasing in two six-part volumes. (We’re looking at the first half.) It’s a paranormal mystery thriller, whose protagonist has frightening powers he can’t control or understand. A serial killer preys on children, and much of the story is told from the viewpoint of children. There’s sweet lyricism and autopsy-room horror, laced into a multi-strand story. The result is often hugely entertaining in the way of King’s fiction, but has some of the pitfalls of his writing – more on that later. Erased even begins with the archetypally “King” protagonist, the blocked author with psychological issues. Satoru is a manga writer in Tokyo, approaching the big three-oh, whose strips aren’t clicking. His disappointed editor suggests he dig deeper into himself, which isn’t welcome advice; Satoru has repressed childhood traumas that won’t be repressed much longer. Satoru also has a secret power. At unexpected moments, he suddenly slips back in time a few moments, a magic warning that disaster threatens. In the first scenes, Satoru senses a lorry driver has just had a heart attack, and saves a child from being crushed by the vehicle. But then a far more personal tragedy explodes, and Satoru becomes a murder suspect. He timeslips again, further than ever before. Suddenly he’s ten years old; time has reversed eighteen years. He’s reliving his childhood, as an elementary schooler growing up in a northern Japanese city in snowblown winter. But this isn’t any winter. This is the winter a killer stalked the city, murdering Satoru’s classmates and leaving him with the lifelong anguish he should have done something. And now he has a second chance. There’s more to the set-up than that – we’ve skipped some spoilers. It’s one of anime’s chewiest thriller scenarios; the first two episodes comprise one of the best openings to an anime serial we’ve seen. Time-travel is common in anime – we’ve increasingly seen it used as a mid-story twist – but the idea of an adult leaping back into his childhood self is potent: a nostalgic dream, a disempowering nightmare. In both the dub and sub, Satoru is voiced by a pair of actors: one plays his child self, the other the adult. (As you might guess, the ten year-old Satoru is voiced by a woman in both the Japanese and English versions.) One of Erased’s best devices is to give Satoru an adult “inner voice” even when he’s regressed to a child. This gives a double vision to the narrative, with moments of humour when Satoru carelessly says what he’s thinking. But it’s ambiguous whether Satoru is an adult any more. Not only is he in a child’s body, but he’s constantly reliving the memories and feelings from when he was a child the first time. The time-travel plot has Satoru trying to change history by befriending a girl in his class who he knows will be murdered in the near future. This involves more doubling as the film switches between timelines – the childhood Satoru remembers, and the one that he’s living anew. Memories are depicted as strips of pre-digital film, complete with perforated holes. All the childhood scenes in the series are shown letterboxed, with black strips at the top and bottom of the frame, while the adult scenes are full-screen. There are other filmic touches. The girl whom Satoru befriends in the past wears a bright red coat, reminding film fans of Schindler’s List and Don’t Look Now. A standout scene has the kids see foxes in the snow who run round them in gyring circles. So far, though, the series has taken little advantage of the sinister, deathly possibilities of snowy landscapes, an opportunity that seems obvious in a serial killer thriller. The children are shown with charm and affection, recalling the flashbacks in Ghibli’s Only Yesterday. Satoru’s relationship with his non-conformist mum he calls “yokai” has humour and pathos. Beside these characters, the other major player – Airi, a deceptively cheery-seeming schoolgirl who befriends the grown-up Satoru – is merely adequate, though she’s written well enough. The show’s big problem is one plotline involving parental child abuse – not because it’s unbelievable, but because it’s sprung on us in an appallingly crass and melodramatic way. You can pinpoint the moment where the show goes wrong; it’s meant to be a shocking discovery of a horrible crime, but it just feels like bad King, children tortured by lurid cartoon characters. It shows too little and too much, and isn’t a fraction as upsetting as the less lurid cruel childhoods of A Silent Voice. It’s a terrible misstep, but the mystery and characters are good enough to survive it, so far. The later episodes have slick twists and story elaborations, but they seem to take the show away from its strongest strand; namely the images of children picking their way through snow like babes in the wood, while a wolf watches from the lengthening shadows and waits. At last! It’s been most of a year since the release of the first half of this time-travel thriller. If you’ve not seen the earlier episodes since then, it may be advisable to rewatch at least some of them, as there’s no time for a recap. The second volume switches track in the opening seconds, plunging our hero Satoru once more back in time. Given this belated release, it’s fitting that several of the characters must wait through time very painfully, motivated either by pure love, or else for horribly twisted reasons which may still amount to a kind of love. 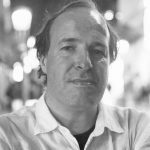 It bears out a weird-sounding remark made by a character who’s the show’s prime suspect, who says that good acts and evil deeds have the same essence. These episodes bring thematic richness to the continually twisty story and killer cliffhangers. As Satoru turns back into a child, emotionally as well as physically, the subject of parenthood comes to the fore. The boy’s mother Sachiko – who we saw murdered back in the opening episode when she realised the killer’s identity – now emerges as the true hero of the series, maternal kindness incarnate. Even Kayo’s monster mother, the show’s weakest character, gets an interestingly open-ended send-off, to leave us wondering if we can pity such a wretch. By the middle of the volume, most viewers will be a step ahead of Satoru and yelling at the screen. But there’s a reason why Satoru can’t see what’s in front of him. A terrifying scene has our hero – who, remember, is just a little boy – realise he’s in a very bad place; it’s scarier than most live-action psycho-thrillers. Some viewers may be thrown out by a scene that involves several characters carrying out a preposterous stunt which would be surely lethal in reality. It’s the kind of Hollywood-style logic that some anime creators hate. But it’s still darn satisfying, as is the story’s end – make sure you watch all through the credits!